"Square makes classic RPG magic on Wii Ware." 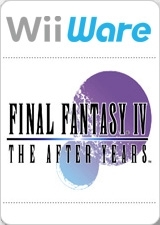 Final Fantasy IV: The After Years is the sequel to the hit RPG FINAL FANTASY IV. The story takes place many years after the original and centers on a young man named Ceodore, the son of the paladin Cecil and the white mage Rosa, who with their loyal and steadfast friends once saved the world from the evil born of the second moon. Now, monsters have begun reappearing in a world that had finally attained peace. The second moon has returned anew. What tidings does this ominous harbinger bring? Familiar faces and new allies join the battle to save the Blue Planet once more from a yet darker threat. the band system is stupid... its like a watered down version of the tech system from Chrono trigger. it cost over 3000 wii points... not worth it in my opinion. mabye i will finish it someday. I was thinking of downloading this untill I read about the DLC. 3400 for the complete game is a bit too much for me. Oh this was released? Forgot about it. Goes and downloads. Can anyone tell me did the shinning force series or this come first, they have an identical style. I love shinning force so I will have to give this a try.